I have written many times before about my one simple mantra for healthy eating – and at this time of year, with the dark late afternoons, falling leaves, dampness and general coldness it is really easy to comfort eat and forget about the basics. My usual breakfast is a vegetable packed green smoothie, which gets me well on my way to my 5-a-day, for extra bulk I often add a heaped spoon of porridge oats, and come the winter I exchange my smoothie for porridge. 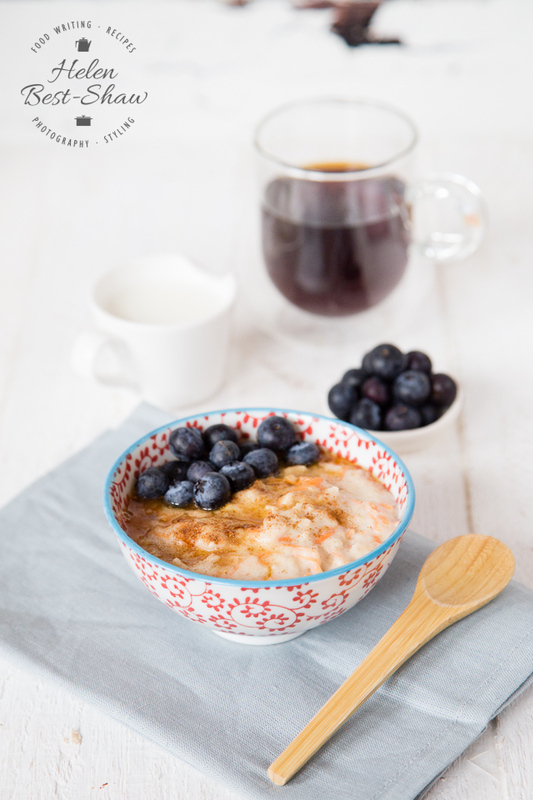 An added benefit of oats is that they contain soluble fibre in the form of beta glucan, in their diets which has been linked to lowering cholesterol. Quaker Oats are running a #FeelingFibrant campaign aiming to get people creative in the kitchen by boosting their fibre intake and creating some oat based recipes. Fibre is an important part of your diet, generally intakes are low in the UK, a good way to reach the 30g of fibre recommended by SACN is to eat a portion of oats every day. Guidelines from the US also recommend that we eat more wholegrains, aiming for 3 x 16g portions. Quaker oats are 100% wholegrain and a good source of fibre, as well as being delicious and adaptable. 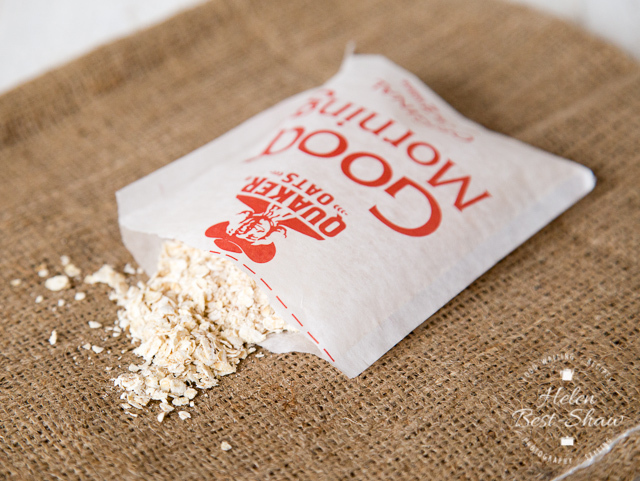 Quaker Oat So Simple was a staple in the days that I had an office job, I kept a box in my desk and could quickly make porridge in the work microwave, simply pour the oats into a microwaveable bowl, use the sachet to measure the milk, mix, cook for two minutes and bingo! Breakfast is served. Nowadays I make my breakfast at home, and porridge can have endless variations. In a carrot cake inspired twist, I’ve added grated carrot and apple to the oats, as well as some comforting warming spices, then cooked in the microwave for two minutes. Oat So Simple indeed! 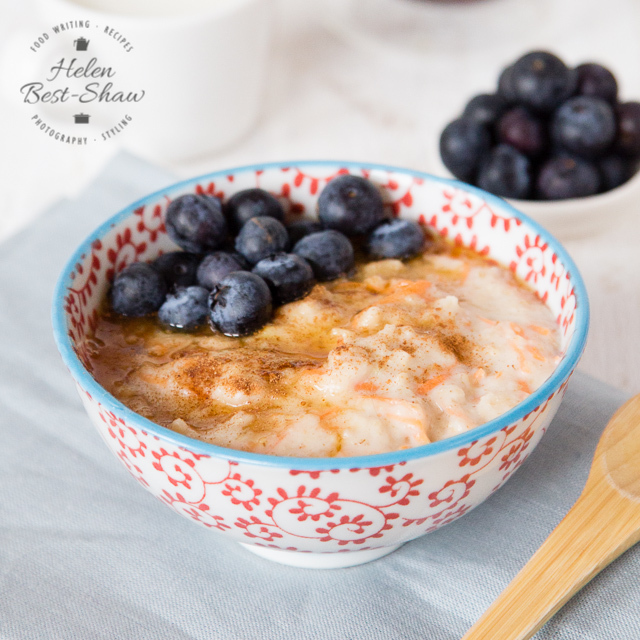 If you try this Recipe: Spiced Carrot & Apple Porridge please tag #FussFreeFlavours on Instagram or Twitter. It is amazing for me when for me when you make one of my recipes and I really do love to see them. You can also share it on my Facebook page. Please pin this recipe to Pinterest too! Thanks for reading Fuss Free Flavours! Mix up your morning porridge, and get well on the road to 5-a-day by adding some carrot and apple. Please the oats, apple, carrots, spices and milk in a microwavable bowl and cook well. Microwave on full power* for 2 minutes. Stir, cook a little longer if needed. Divide between two bowls and garnish with berries, syrup and a pinch of cinnamon to taste.